South Jakarta Water Resources Sub-dept. 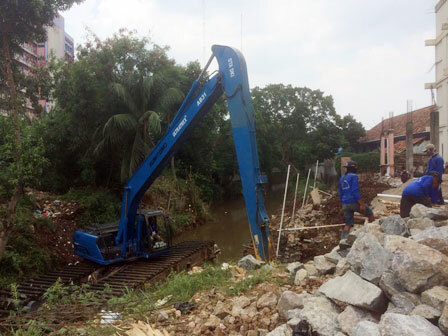 is repairing a collapsed sheet pile on the Krukut River, precisely next to Tendean Square. Thus far, its repair has reached 50 percent.
" We repair the sheet pile again. It was collapsed by the end of December 2017"
South Jakarta Water Resources Sub-dept. Head, Holy Santoso disclosed, sheet pile is repaired up to 23 meters. This sheet pile was collapsed, as it was used as dredging access of Krukut River. "We repair the sheet pile again. It was collapsed by the end of December 2017," he expressed, Thursday (4/12). He explained, sheet pile repair has been started since February. Within one and a half months, it is targeted to be finished. "After it is finished, water will flow smooth and can reduce flood potential," he told. In the field, his side has sent 25 officers and 1 unit of heavy equipment to speed up the repair.